When I first opened the book REGRET by Gabrielle Faust, I was greeted by an Introduction written by Los Angeles filmmaker and writer John Palisano. Mr. Palisano seemed very enthusiastic about Faust's writing, and I knew I was in for a treat when he described REGRET as "a fever dream captured in words" and that it has "all the right chords and voices them in new and unexpected ways." In thumbing through the book, fanning the pages, I see that each chapter is preceded by artwork. Not just any artwork, however. These are demons. And not just any demons! The demons in Faust's book are literally right out of hell: Desiderium, the demon of ardent longing; Sonnellion, the demon of hate who is the fourth in the order of Thrones; Cresil, the demon of impurity and laziness who is third in the order of Thrones; Vetis, the demon who specializes in corruption of the holy; and finally the most famous demon in the book, Belial, who is the demon of lies and is acknowledged in the Bible as a source of great evil, and is the closest to Lucifer himself. All this before I even read a single word of the book! So as you can imagine, I had great expectations for Gabrielle Faust's REGRET. And my great expectations were met, very much so. Faust begins the book by introducing us to Marcus, who is not a demon but very human. His love life is falling apart, and his live-in girlfriend Brenda has left him a note telling him she has "left for a vacation away from him." Slowly he sinks into a black depression, and wants to do nothing else but sit in his easy chair. Beyond the over-all unhappiness in his life, what I related to was Marcus's dissatisfaction with the mundane grind of his job. Who hasn't felt like this about one's job: "The temperature of the room was too cold, the sound of fingers clicking on the keyboards like a rain of gunfire, the air too filled with the scent of dust and correction fluid. Marcus looked up to the round clock affixed to the wall above the doorway. The second hand ticked in a circle with an agonizing slowness that made him want to cry; seven more hours to go." So what does Marcus do about it? He gets into an argument with a coworker, then when called on the carpet to be disciplined, he loses control and punches his boss! I felt like cheering. Although that scene is fantasy for me, it is very real for Marcus. He goes home, filled with fear and regret. He knows he has lost his girl, lost his job, and lost his will to live. He realizes that he will most likely soon be arrested for assault. When he is at his low point and considering suicide, that is when Desiderium appears to coax him into picking up a gun. This is where Faust's book becomes unique. It is a fresh approach and it is full of surprises. Just when I believe I can guess what is coming next, Faust takes yet another twist and turn and again surprises me. What happens to Marcus after suicide? A real creep scene was when he runs into his old neighbor Beasley, who knows that Marcus is dead: "He could smell Beasley's fear beneath the stale potato chip oil saltiness of his usual odor and knew that the fine hairs on the backs of his arms and legs were prickling with instinctual caution." The book continues into a romping roller coaster ride of demons and their purpose on earth: to capture souls that are unique to the demon's specialty. Marcus is not quite a demon, but as a suicide, he is certainly damned. And he knows he must also capture souls to create his place in the hierarchy of Hades.....and the soul he wants the most is that of Brenda. 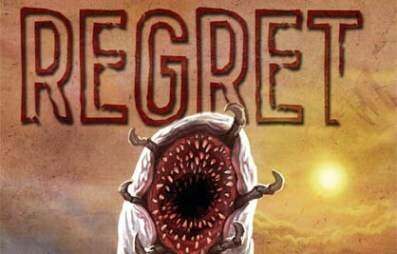 REGRET is a very satisfying book. It is short in length (139 pages) but long in suspense and fear, and did I mention surprises? Gabrielle Faust is an expert storyteller and she writes with beautifully descriptive prose. Here is an example of the wonder of her words: "Distinctly, Marcus could hear surreal haunting sounds winding in on whispers of unfelt wind form the landscape beyond the bar, melodies of cries and unearthly music that bent and swayed in a malicious beauty he found strangely alluring." All in all, I highly recommend REGRET. It has excellent character development, and best of all, it has lots of excellent demons. You can buy Regret HERE. 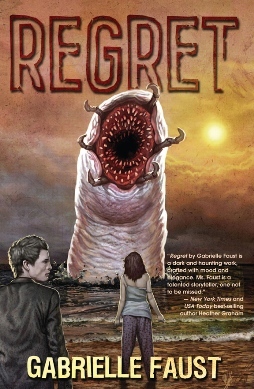 Gabrielle Faust is the author of the acclaimed vampire series Eternal Vigilance, three collections of poetry entitled Before Icarus, After Achilles, Crossroads, and The Beginning of Nights, the horror novella Regret and its soon-to-be-published sequel, Revenge. She was the Guest of Honor at the Queen of the Damned Vampire Ball in 2008. In 2009 she was a Special Guest of the Endless Night Festival in New Orleans and was crowned "New Orleans Vampire Royalty" by the Vampire Lestat Fan Club at the Tru Blood & Gold vampire ball alongside Charlaine Harris, the author of the Sookie Stackhouse series upon which True Blood was based. 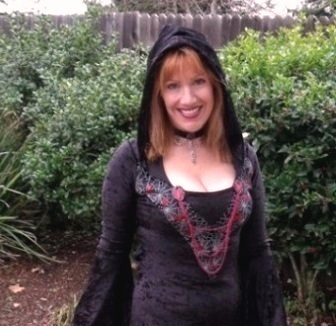 Her short stories and editorial commentary has appeared in a variety of online and print publications such as SciFiWire, Doorways Magazine and Fear Zone. Faust was awarded the 2011 Texas Social Media Award by the Austin American Statesman. More information on Gabrielle can be found at www.gabriellefaust.com.